When it comes to coaching strategy and systems, is it better to adapt to the strengths and weaknesses of the lot your given, or bend the will of players to execute a system you feel wins hockey games? And what if you were given a clean slate and had a direct say in the makeup of the team you’d be coaching, your way? 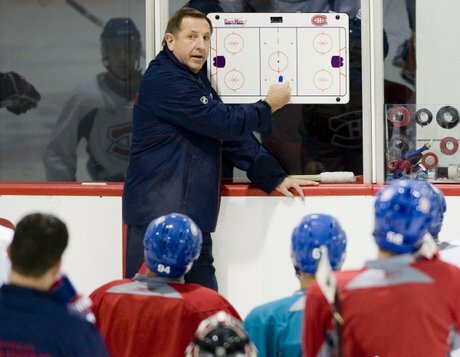 For Jacques Martin, not only did he get a clean slate, he had a direct say in the player acquisitions former Canadiens General Manager Bob Gainey would make on his behalf to fit the system he planned to implement in Montreal. As someone who stopped coaching the year before and had been a peer in the GM ranks since 2006, Martin was in a unique position to advise Gainey and then assistant GM, Pierre Gauthier, on targeting players who could best execute his system. And just how clean a slate was Jacques Martin given? Eleven players left the Habs that summer, HALF the roster including seven forwards, six from the top three lines; Koivu, Kovalev, Tanguay, Lang, Higgins, Kostopoulos and Dandenault and four defensemen; Komisarek, Brisebois, Schneider & Bouillon. The “Go for it” strategy to win the Stanley Cup during the Montreral Canadiens 100th season ended in disaster and missed opportunity, trading away a second round pick and flipping thirds with Atlanta to try and secure the last playoff position in the last game of the regular season. Given the situation, had the Habs taken the long view and traded most of the outgoing players for prospects and picks at the deadline rather than be buyers, the Canadiens would have been in a far stronger position to reload under Martin, both with available cap space that summer and a restocked farm system. A valuable lesson for casual fans that big revenue teams like the Montreal Canadiens sacrifice long term success far too often for a chance at just one round of playoff revenue… while praying for more. But I digress. Twenty nine days after Jacques Martin and Bob Gainey uttered those words and one day before the July 1 free agent feeding frenzy began, Gainey pulled the trigger and traded for Scott Gomez to become the center piece around which Martin’s system would be built. The day after that, Gainey signed UFAs Brian Gionta, Mike Cammalleri, Jaroslav Spacek and Hall Gill, followed soon after by Mathieu Darche, Travis Moen and Paul Mara. To fully comprehend the strategy Martin would use in Montreal and the systems designed to execute that strategy, it’s important to first examine and understand what aspects of the game truly contribute the most towards success. All things being equal, offense wins Stanley Cups. More specifically, offensive pressure is critical so Jacques Martin is right in that regard. Winning teams need to be top ten in most aspects of the game and while some teams can get by having just one or two elements outside the top 15, teams that implement and execute an attacking style of hockey are rewarded with a Stanley Cup. For fans who believe that anything can happen once the playoffs start, that marketing department belief system only goes so far as eight of the last ten Cup winners won their division. The two exceptions were New Jersey who finished with the second best record in the East in 1999-2000 and Pittsburgh in 2008-09 who were fourth best. Of note, every Stanley Cup winner this past decade had home-ice to start the playoffs, a pattern that hasn't been broken in a non-strike year since the 1992-93 Montreal Canadiens. Clearly, playoff ranking matters and starting on the road rarely gets you past the second round, let alone a trip to Disneyland. While defense is important, offense wins hockey games and doing that requires a lot of quality shots as described above. Eight of the last ten Cup winners were top six in goals scored and only once did a team rank outside the top ten with New Jersey finishing 14th. The Devils ranking was more than off-set by stellar results in several other key categories. It’s not enough to just throw pucks on net. What matters most is generating a lot of quality shots in a league where good goalies get beaten only about eight per cent of the time. That means bodies screening the front of the net for tips along with second and third chances at loose pucks. Only once in the last ten years has a team (Pittsburgh) not been in the top seven in shots on net. On average, about 65 per cent of a typical NHL game is played 5-on-5 so naturally the bulk of goals are scored at even strength. With less open ice, entering the offensive zone with control of the puck, winning one on one battles on the side boards, corners and behind the net are keys to maintaining possession and generating the offensive pressure Jacques Martin alluded to. Only two Cup winners (Carolina and New Jersey) were ranked outside the top 10 and only one, New Jersey was ranked (19th) outside the top half of the league. Looking at the goal totals tells the full story on 5-on-5 ratio. No surprise really. A key to winning is preventing opponents from not only generating a lot of shots but quality shots. That means shot-blocking, pressuring the offense and having a solid face off ranking to gain puck control in the defensive zone. Only three times has a cup winning team (Pittsburgh, Carolina and Detroit) not been top 5 in allowing the least amount of shots on net. The key to fewer goals allowed is fewer quality shots on the goalie which means shot-blocking, forcing teams to the perimeter, having a defense that can move bodies, clear rebounds and allow the goaltender to see the shooter. Seven teams were ranked top 10 and only two (Pittsburgh and Carolina) were ranked (17 and 20) outside the top half of the league. Teams with a higher goals against could off-set with higher goal support, which both Pittsburgh (6th) and Carolina (3rd) did the years they won. Given that most goals are scored at even strength, people tend to fixate on the percentages. Still, seven teams were ranked top 10 and just two (Carolina 19th and Colorado both 18th) were ranked in the bottom half of the league. Most Cup contenders have a PK north of 85% so teams that have trouble scoring 5-on-5 must generate more power play opportunities and/or tighten the defence even more to compensate. Establishing puck control matters but it’s not critical. Six teams were ranked top 10 and only Pittsburgh (19th), Tampa Bay (16th) and New Jersey (16th) were ranked in the bottom half of the league the years they won. As with the PK, people tend to focus on the percentages and not the actual number of penalties their system forces other teams to take. Without question, a solid power play can be a difference maker as a 11th best average ranking suggests but ultimately it’s risky to overly rely on the power play to off-set a lack of scoring elsewhere, particularly 5-on-5. Excluding his first year in Ottawa, the entire time Martin coached the Senators they were a puck-possession team capable of sustained offensive pressure. Lots of quality shots producing enough chances to generally be a top 5 club offensively and top 10 5-on-5. The Achilles heel of all those Senators teams was primarily in goal where the weak save percentages carried into the playoffs in five of seven playoff appearances under Martin. There are valid concerns that he appeared to have difficulty adapting to changing conditions under pressure in the playoffs but that’s hard to quantify. What can’t be ignored is the fact the Senators got better the after Martin left. Their offense went up and their goals against went down relative to the rest of the league in a post-lockout season that saw the average number of power play opportunities per team jump by about 100. Most telling was the goal differential widened by 30 over Martin’s last season, helped in large part by even more offensive pressure generated the most quality shots in the league having the second best goals against in the league. So, for as good as the Senators were under Martin, one has legitimate reason to question if he was actually holding them back. When Martin went behind the bench in Florida he altered his system to compensate for fewer offensive players capable of playing solid, two-way hockey. His strategy became more passive and while 5-on-5 goal scoring benefited from a group of big forwards who could and did capitalize on a volume of low percentage perimeter shots, the Panthers 5-on-5 ratio fell every year Martin was coach. Where his system ultimately failed was the passive system he implemented just didn’t force teams to take enough penalties. In fact, the number of power play opportunities dropped every year he coached the Panthers, ranking them 30th, 30th and 29th, effectively wasting an improving power play percentage that was 24th, 13th and 6th during his tenure. And yet again, after Martin stopped coaching the team improved. More wins, more goals, fewer goals against and much better 5-on-5 goal scoring that jumped back up to sixth best in the league. Jacques Martin had a full month of meetings with Gainey, Gauthier and their pro scouts to have a say on which number one center the team would target to anchor his system and which players would best complement the puck-possession, best defense is good offense mantra he spoke about when the Canadiens signed him to a four year contract to coach the Habs. Trouble is, Martin brought the Florida system to Montreal, not Ottawa’s which he alluded to in quotes to the media the day he was hired and ultimately, it’s costing the Canadiens wins and a higher playoff ranking. As I described in the composite Stanley Cup winning team, defense does matter and that’s all well and good but it cannot come at the expense of offense. People may point to the wins, currently tied for sixth in the NHL as proof-positive that Martins system works. It’s not. Had it not been for Carey Price not only bouncing back this season but being a top 10 goalie in the NHL and top five for the first quarter of the year, the 25th ranked offense (Finished 22nd) would only be good enough for 10-12th in the standings. Simply put, if Carey Price was just good this team would be just a few points away from a draft lottery pick, the exact same place they were last year as trade deadline day approached and the primary reason is an over-commitment to defense at the expense of offense, and it’s costing the Habs wins. Despite more victories this year, the Habs are on pace to score just one more goal than last season (Finished with one more goal) which ranked their offense 25th. This season that puts their offense 24th and no team currently holds a playoff spot with fewer goals scored. Martin didn’t or couldn’t install a puck-possession system in Montreal and part of that is a lack of sizable players who can win enough puck battles along the boards to retain possession and maintain pressure in the offensive zone, especially in front of the net and in the slot. The Habs are ranked ninth in 5-on-5 ratio but sit 24th (Finished 26th) in actually scoring goals 5-on-5. Again, goaltending and defense have elevated the ratio and masked the inability to score goals at even strength where 65 per cent of the game is played and where a full two thirds of all goals are scored. To fully appreciate the situation, it helps to comprehend what Carey Price said recently about how it’s easy for him to play goal when the team is able for force shooters to the perimeter. Indeed it is. The Habs 6th ranked goals against average (Finished 8th) has limited opponents to an average of just eight scoring chances per game from the front of the net or slot. Not only are the Canadiens also being limited to just eight scoring chances from the same piece of real estate, it’s taken 20 per cent more shots from the perimeter to get those prime chances. In short, opposing teams are doing a far better job forcing the Habs to the outside than their own sixth ranked defense, to the point where 72 per cent of their shots are low percentage attempts. In contrast, the Carey Price is pleased 64 per cent of the shots he faces come from the perimeter. The lack of a sustained volume of quality shots 5-on-5 has ultimately hurt the Habs and part of reason is too many peripheral players and too few who are big or mobile enough to win board battles and go to the net and stay there. Beyond Max Pacioretty, the only other player willing to regularly park himself in front of the net is 34-year old Mathieu Darche, who gets just eleven minutes of ice time per game. Players like Gionta will dart in and out for rebounds and tips but they can’t stay in the paint or block the view of opposing goaltenders. “With a team like that… again with its smaller guys, and the premium guys like that, Gionta, Gomez, Cammalleri… guys like that, you definitely have to have a cast of characters around there that could protect them and be there and play a physical game, not only to protect them and to be there for them but so you can score goals 5-on-5. They can’t score goals 5-on-5 because they don’t have the size. Because Martin’s Habs are being forced to the perimeter, unlike his teams in Ottawa and Florida, his current system of a passive offense based on transition and turnovers has exposed it’s key weakness. That style of play doesn’t force opposing teams into taking a lot of penalties, particularly hooking, holding and tripping calls that a pressure game forces opponents to take more often. The Canadiens currently rank 18th in total power play opportunities (Finished 16th) and are on pace for 291 (Finished with 290), a 30 PP improvement over last year’s 30th ranked team so while there’s been some progress, it’s not nearly enough to compensate for the lack of production 5-on-5. If Jacques Martin won’t or can’t alter his system to increase 5-on-5 goal scoring and force teams into taking enough penalties to make them top 10 in PP opportunities, the stress on Carey Price and the defense to squeeze more blood from the stone and tighten up even more is an unrealistic expectation. It also shifts far too much responsibility onto the power play to make up the difference against Cup contending teams who on average limit opposing teams to a 15 per cent success rate, or worse. One can’t help but notice the attacking style Guy Boucher has implemented in Tampa Bay has forced opponents into giving the Lightning the second most power play opportunities in the NHL (Finished 2nd) while being able to capitalize on the volume of chances to be ranked third in PP goals scored. Even their 5-on-5 play has steadily improved once they found a goalie who could stop a beach ball. That said, Jacques Martin does deserve a sizable chunk of credit for the defensive play of the Habs but his over-commitment to that aspect of the game has negatively impacted the Canadiens ability to generate offense and ultimately that has and will cost them wins, turning the Stanley Cup winning recipe upside down in the process.